ALUMA-KLEAN Spray-Wash Detergent / 9-kg. When you use Ranger's premium line of parts washer cabinets, you're going to need a lot of soap. Look no further than Ranger's Aluma-Klean 9-kg. spray washer detergent, designed specifically for all your spray wash needs. Removes oil, stains and grease with ease! Our industrial parts washer soap is made for the very toughest cleaning applications, whether you own a Ranger RS-500D or RS-750D. 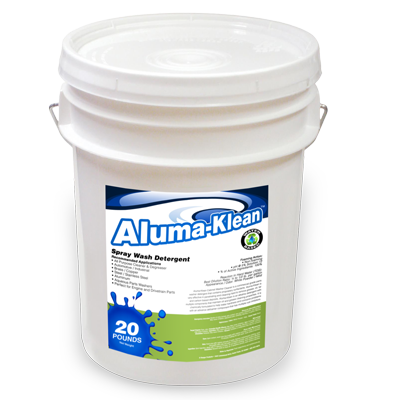 Even if you own a parts washer from someone else, we’re proud to offer Aluma-Klean parts washer soap for your industrial parts washing needs. Ranger Aluma-Klean Spray-Wash Detergent is a non-foaming, low pH, mild-alkali, water-soluble, powdered detergent especially formulated for high-pressure cabinet cleaners. Incredible cleaning action removes grease, oil, baked-on stains, carbon, protein and even some paints. Should be used by experienced operators only. Be sure to test wash all parts before using this product and remember that excessive contact, heat or cleaning times may cause pitting or blackening of some metals.